Credit for portrait of Emily Dickinson: Todd-Bingham picture collection, 1837-1966 (inclusive). Manuscripts & Archives, Yale University. When one becomes familiar with the biographical sketches of literary artists, one becomes accustomed to a certain amount of tragedy. Many great artists, like Dickinson who embraced the genre of Dark Romanticism, suffered through difficult childhoods and trying circumstances. The art almost seems to blossom from the struggle. This is not the case with Emily Dickinson (1830 - 1886). 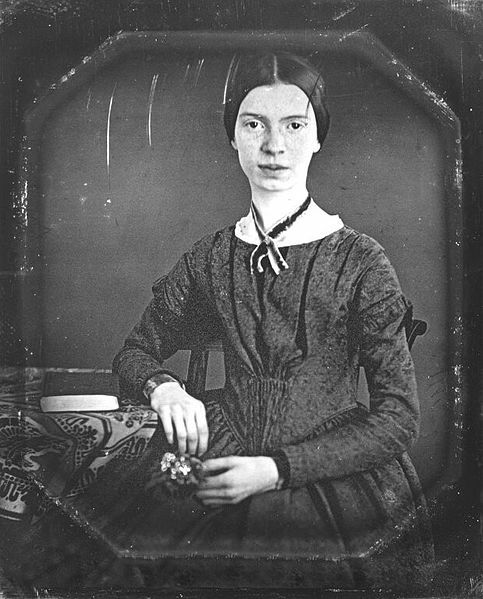 Born into a well established family, with access to a fine education and the other perks and benefits of society, circumstance was not the press that squeezed the creative arts from Emily Dickinson. After receiving a fine education at Amherst Academy, Emily left the family home to enroll at the Mount Holyoke Female Seminary. She did not stay long and soon returned to her family home. The beginning of a withdrawal from the outside world, into a more isolated and reclusive world of her own making. She became a local oddity in her own community, often dressing in white, and increasingly reluctant to participate in society, often refusing to greet guests at the family home. As she grew older, she even became reluctant to leave her own room. Her isolation was broken by the exchange of letters, which she used to maintain her friendships. At some point in all our lives, we come across an individual choosing to live in a way that makes us wonder, "What are they thinking, are they crazy?" Perhaps we would have wondered that very thing if we had lived in Emily's community. 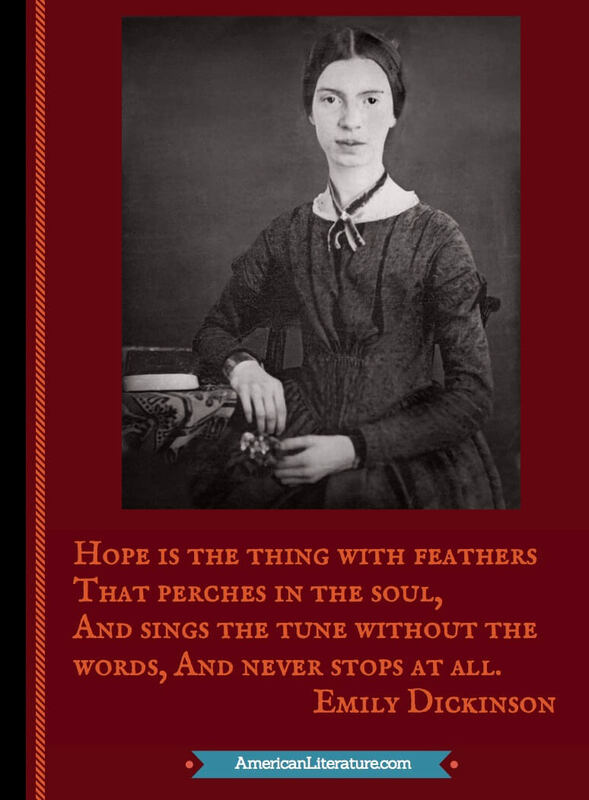 But with Emily Dickinson, the speculation is not unrequited; we know very well what she was thinking; she let us know in her poetry and her writing. Dickinson wrote almost 2,000 poems, less then a dozen were published in her lifetime. After she died in 1886, her younger sister Lavinia discovered the large collection of poetry. Even the work that was published while she was alive was heavily edited to fit the convention of the times. In 1890 her first collection of poems was published posthumously in a heavily edited form. It wasn't until 1955 that a complete and unedited edition of her poetry was released. It is a luxury, for her many fans, to have access to poems and letters where we can often answer the question, "What was she thinking?" One needs little imagination to wonder what she was thinking when she sent the following letter to Thomas Wentworth Higginson in April 1862. MR. HIGGINSON,--Are you too deeply occupied to say if my verse is alive? 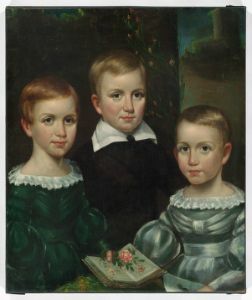 Emily is the child on the left, she is pictured with her sister Lavinia and brother William. The Atlantic Magazine has an October 1891 article by Thomas Wentworth Higginson that Dickinson fans will wish to read. Dickinson's most prolific writing coincided with the Civil War, though she rarely referenced it directly. You might enjoy our collection of Civil War Stories and American History.